Laguna Art Museum is the museum of California art. It collects, cares for, and exhibits works of art that were created by California artists or represent the life and history of the state. Unlike any other museum in the state, it collects California art and only California art, and ranges across all periods and styles, nineteenth-century to present-day. 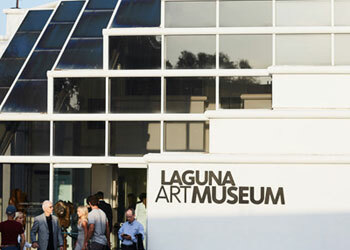 Laguna Art Museum seeks to develop a permanent collection that represents the rich history of California art; stage serious exhibitions of high artistic quality that complement the collection; offer a robust education program for children, students, and adults alike; and serve the community as a cultural and social center. The museum is located on the corner of Pacific Coast Highway and Cliff Drive next door to Las Brisas restaurant. Metered parking is available surrounding the museum on Cliff Drive and Pacific Coast Highway. The meters take quarters and credit cards only. Additional street parking is available in the residential area east of the museum, across Pacific Coast Highway.